United Nations secretary-general, Antonio Guterres has stated that Nigeria's Amina Mohammed, the United Nations deputy secretary-general has his full support and confidence. Stéphane Dujarric, the UN Secretary-General's spokesman while responding to an inquiry on the allegation of fraudulent authorizations of export permits of rosewood from Nigeria to China against Mohammed during UN daily briefing on Thursday, quoted Guterres as having reiterated his confidence in Mohammed. 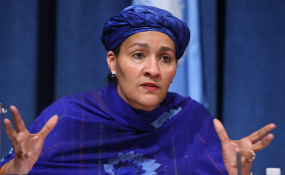 A Washington-based environmental group, Environmental Investigation Agency (EIA) claims that Mohammed authorized illegal exports of endangered rosewood during her term as Nigeria's Environment minister. Wood from rosewood tree also known as kosso is valued in China for its pinkish hue and purplish-brown streaks. Environmentalists are worried that since 2012, the export of rosewood has decimated forests throughout West Africa. They fear that uncontrolled deforestation of the region's woodlands will encourage soil erosion and accelerate the spread of Saharan desert into productive areas. Dujarric on Thursday, further disclosed that Guterres was aware of the allegations against Mohammed and reiterated his "support and confidence in her." general's spokesman, Mohammed has stated that "her actions as Nigerian Environment Minister were intended to deal with the serious issue of illegal wood exportation." As a result, "she instituted a ban and set up a high‑level panel to find policy solutions to the crisis of deforestation in Nigeria. Ms. Mohammed says the legal signing of export permits for rosewood was delayed due to her insistence that stringent due process was followed. She said she signed the export certificates requested before the ban only after due process was followed and better security watermarked certificates became available." It is a well-known fact that Mohammed imposed a three-months ban on trade in rosewood while she was Nigerian minister of Environment. She denies EIA's charges, saying she never approved the export of mislabeled logs and that she only signed permits for kosso that was still in Nigeria. She also said the only reason she signed the CITES permits during a wood trade ban was that the documents, which were ordered before the ban came into force, were delayed at the printers. Speaking to the our correspondent on the issue, the minister of state for Environment Ibrahim Usman Jubril stated that "We reject it in totality. It is a baseless allegation, completely unfounded and we find it difficult to understand how they came about these assertions. These allegations are false completely. Nobody is in doubt of the credibility of the former minister and now deputy secretary-general of the United Nations and about her integrity and her commitment to saving the environment of which she served as the minister up until the end of February this year. "I have worked closely with her from November 2015 up to the time she left here and there was nothing that was done that I don't know about. "For somebody to allege that money was given to her is very unfortunate. It will definitely bring people who have the intention to do good to have a second thought in serving the country. "Because of the commitment of the minister to do the right thing we instituted a ban in April last year to suspend the export of this type of wood. After the ban was put in place there was huge cry from across the country, particularly from major stakeholders who are involved in this export business, the National Assembly and many people were on our neck and the main complaint was that we did not give sufficient notice. "In June we called a stakeholders' meeting, all the commissioners of Environment and Forestry in the country, the major exporters and Wood Traders Association and Wood Processors Association were all in attendance in Abuja. We agreed that yes we did not give sufficient notice before the ban but that we had to act in order to save our environment and to put proper governance structure in place to be able to regulate this trade because it is not about Nigerian alone, it is about international convention. "So after that we agreed to temporarily lift the suspension which we said was until the end of the year which was in June, so we gave them up to six months within which to tidy up their things and within this period we were able to set up a committee to investigate and give us details and the way forward so that we can have a sustainable forest management. "They submitted their report and the minister left in February ending and I started over-seeing the ministry. I carried on with what we started with her. We took a memo to the National Economic Council, highlighting this problem of continuous logging and the need for sustainable forest management, In the National Economic Council, all the governors in attendance concurred with us. "We took another memo to the Federal Executive Council in March and the Federal Executive Council approved far-reaching recommendations which we met and despite the fact that we said we were going to enforce suspension for three months, that is starting from January up till March, we did not lift that suspension until August this year. So I wonder how somebody would come up with an allegation that somebody has given money and after money has changed hands and we still sit on this documentation for eight months. It is incredible; it is unbelievable. Nobody would give such amount of money and you keep him waiting for eight months. So we found this allegation totally unfounded, particularly on the aspect of bribing the ministry or the minister. It is really very, very sad to say the least. We never anticipated that. She never did anything like that. Anybody who knows Amina Mohammed would never think of associating her with these allegations because she is a woman of high integrity. I totally disagree with the allegations; they are false; they are unfounded and they have no basis at all." Copyright © 2017 Leadership. All rights reserved. Distributed by AllAfrica Global Media (allAfrica.com). To contact the copyright holder directly for corrections — or for permission to republish or make other authorized use of this material, click here.